Fugly Horse of the Day: What a cool idea! And one that almost any horse rescue could implement. Last year, the Minnesota Hooved Animal Rescue Foundation held a Trainer's Challenge. 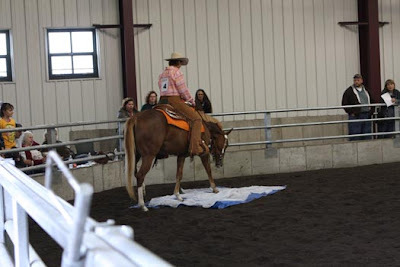 Much like the "Mustang Makeover" events we've heard about, this challenge gave trainers 100 days to make something of a previously untrained and unwanted horse. As a result of this event, seven out of the ten rescue horses who participated got adopted to new homes. I think this sounds like a really cool idea. A challenge like this is great motivation for volunteer trainers to put in consistent work with a horse. They had a wide range of trainers participate, from NH to dressage. While I like some of them better than others, at least based upon the pics (you all know how I feel about hanging all over the horse like it is playground equipment), I love the overall result of the challenge - horses who became more valuable and more adoptable. This was a creative way of dealing with the challenge many rescues face - too many untrained horses at once, and not enough money to put them all into full training. So, if you're a rescue and you're wondering how to motivate your volunteers or board members to get out there and get those horses working, give 'em a goal like this! A regular horseshow is also a good idea - there's another SAFE show scheduled for this August and everybody is already eagerly preparing their foster horses for a show-ring debut. People like a challenge and in this kind of challenge, the real winners are the horses, who come out of it with skills that can keep them safe for the rest of their lives.